Shield Them with Conductive Coatings from MAJR! Plastics definitely have their advantages when building hardened enclosures, BUT they easily allow penetration of EMI or RFI waves, causing enclosure failure. 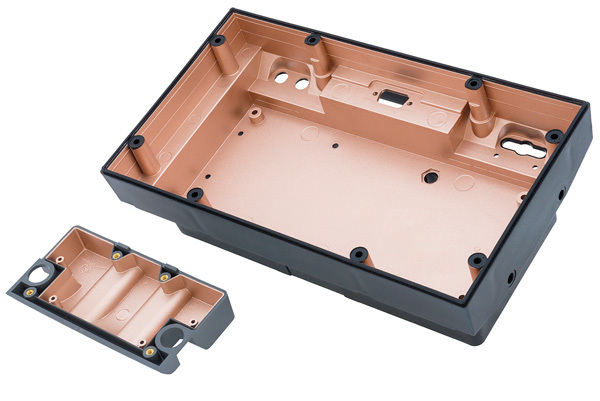 Conductive Coatings from MAJR are the quick and easy solution for this convenient substrate, and once painted your plastic enclosure will offer superior EMI/RFI attenuation while also suppressing electrostatic discharge. Our conductive paints usually contain non-oxidizing copper which, when mixed thoroughly, gives the plastic surface its conductivity. With approximately 25% solids, even a piece of paper can have conducting/attenuating qualities when they are applied. But the real advantage of our conductive paints lies in their low cost, ease of use and flexibility during production. With superior attenuation and the ability to cover complex plastic enclosure designs more rapidly and easily than chemical plating dips or vacuum deposits, conductive coatings are the cost effective and preferred EMI shielding choice, whether you are covering one protype or a mass production run. …Have you considered MAJR Products’ extensive selection of and experience with EMI Shielding Gaskets and Tapes? In a multitude of stock or customizable configurations!